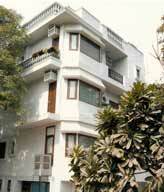 ..:: Welcome to Sita Residency Website ::..
Sita Residency is centrally located in the heart of South Delhi. It provides a unique blend of Indian hospitality, natural environ and the comfort of modern living. Panoramic and scenic views of beautiful and ornamental parks with lush green trees on its three sides give you the feeling of being on a hill station. We provide courteous service with personal touch in a traditional Indian way. An experience of exotic comfort at a very affordable cost awaits you at Sita Residency. No matter whether you are a business or a corporate traveler a medical or leisure tourist you would find Sita Residency a perfect place to stay at. Rooms at Sita Residency are well appointed, tastefully furnished, hygienically clean, air conditioned, having attached bathrooms with western toilets and modern fittings, fully made up beds with comfortable mattresses.